Target Outdoor & Indoor Furniture up to 40% off! 2 Days Only! 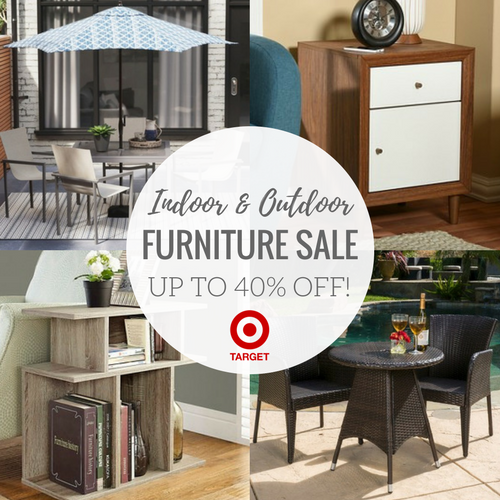 Home / Deals / Online Deals / Target Outdoor & Indoor Furniture up to 40% off! 2 Days Only! Among the things people have been asking me about, I would say patio furniture is at the top! That is why I was so excited to see this Target Outdoor & Indoor Furniture sale going on today and tomorrow only, 3/10-3/11! If you have Target REDcard, you will get an additional 5% Discount! Sign up for REDcard here. This sale is on online exclusive items and you will get another 10% off when you apply the code MARCH. You will see the savings automatically applied to the items in this sale. This 26″ Steel Wood Burning Folding Firebowl is on sale for $59.99, and you will get 20% off if you choose order pickup. You can get this Prospect Swoop Anywhere Chair for only $47.98, down from $160. One of the best deals for outdoor sets is on this Christopher Knight Home Brayden 3-Piece Wicker Patio Bistro Set down to $216.99-was $307! Check out all of the deals in the Target Outdoor & Indoor Furniture, and don’t forget to use your Target RedCard! And check out the Wayfair Patio Furniture Sale with up to 70% off! HUGE Bottles Downy Fabric Softener only $10.21! Best Price on an External Battery Charger!